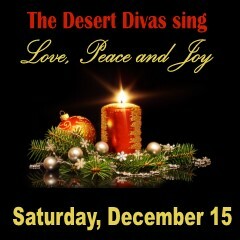 DESERT DIVAS "SING LOVE, PEACE AND JOY"
Come and get in the holiday spirit as you support our Sun City Grand Women's Vocale Ensemble, Desert Divas, under the direction of Wendy Fentiman. Seated in a festive setting at round tables of ten in the Colonnade La Vita Room, you will experience the sounds of the season with a great variety of familiar and new Christmas music and enjoy refreshments with your friends, families, and neighbors. This concert will be accompanied by our combo consisting of Joyce Rader-piano, John Clark-bass, Jack Jackino-drums and Dan Reed-trumpet/flugelhorn. Contact Wendy Fentiman at 623-640-6450 - Purchase tickets at: www.scgrandmusicclub.com; www.suncitygrand.com or at the Activities Desk (open MF 8am - 4pm)- Please note venue change from our past concerts. The Colonnade - La Vita Room.